My issues with Pierre Omidyar’s $250m journalism startup, The Intercept, are well documented. Many media organizations, including Pando, have investors but the fact that the Intercept is 100% owned by a single tech billionaire creates an insane risk of conflicts of interest. And that’s before you consider that the Intercept was founded to publish Edward Snowden’s leaks about how the government is misusing our data, and how some tech companies have been complicit in that. And yet, of all the companies implicated in the Snowden docs published on the Intercept, there has been zero reporting of wrongdoing by eBay or any of Omidyar’s other business interests. Another conflict: Despite owning a site that aims to publish embarrassing government leaks, Omidyar has extraordinarily close ties with the White House and the State Department. And, as Mark Ames has reported, he is also close to right wing world leaders like Narendra Modi, and even partnered with the US government (via Omidyar Network to fund the coup in Ukraine. The Drone Papers was published last year but is still drawing praise for the Intercept. Just last month, an organization called the Online News Association gave the Intercept its Investigative Data Journalism award along with a share of $15k in prize money for publishing the Drone Papers. The site was also nominated for a General Excellence award. Omidyar himself retweeted the celebration before, presumably settling down to write thank you cards to all the people who made the award possible. Hopefully his thank you list will include the ONA’s financial supporters without whom the organization wouldn’t exist. There’s a handy list of those supporters here, including a full roster of “Major Funders”. 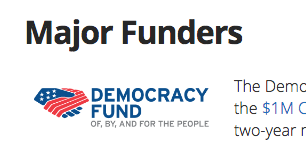 Right at the top of that list of funders of the group that just handed Omidyar’s site its big award? Trebles all round, as Private Eye would say.